and we work hard to ensure your day is perfect! Professional quality and attention to every detail is what we do. We turn your wedding dreams into reality! Online wedding planning and day of wedding coordination is always included. 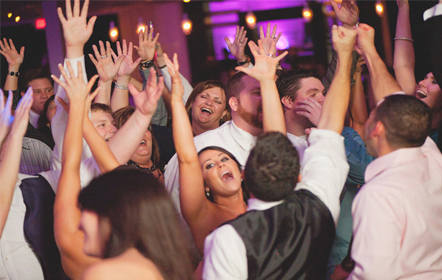 Wedding DJ Entertainmentis our specialty! Professional quality and attention to every detail is what separates Black Tie Entertainment from other wedding DJs. 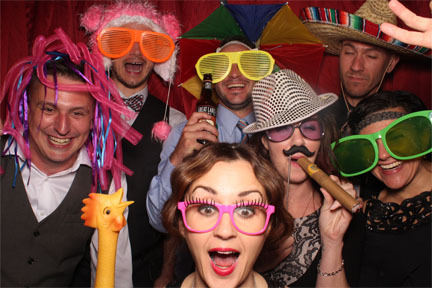 Weddings are our passion and Black Tie Entertainment will create memorable moments for you and your family and friends. We take pride in customizing every event and providing superior service. We offer the largest music selection in the Canton - Akron - Cleveland Ohio area from the 80's & 90's to today’s greatest hits. Our music library is updated weekly and we always welcome your guest’s requests. We use nothing but the best in sound and lighting equipment to ensure the best quality and reliability, and we always carry back up equipment. 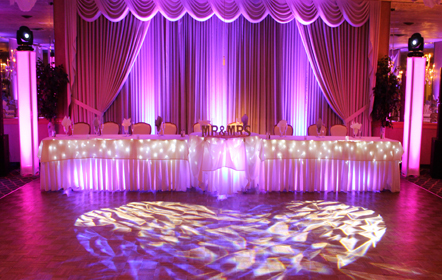 Dazzling dance floor lights, ambient accent up-lighting, name in lights, Photo Both and music for your ceremony are always an option to add that extra excitement. As the Master of Ceremonies our wedding DJs serve as the reception's coordinator to assure that all events proceed smoothly and on time. Our aim is to carry out your tastes and preferences in a way that ensures a seamless, stress free event for you and your family. We check in with you throughout the course of the event and make sure your bridal party, service staff, and other vendors are kept informed as to when key formalities and events are happening. This is our approach at Black Tie Entertainment. will bring your reception to life! When it’s time for you to walk down the isle you want it to be perfect. We can help you with that by providing the right music for your ceremony. 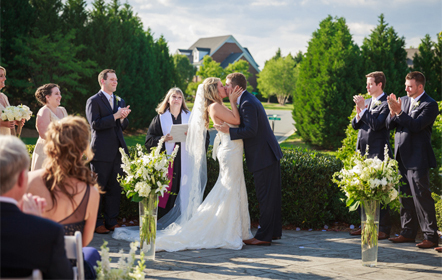 We provide a ceremony sound system and a wireless mic for the officiate and reader. Planning your wedding day is making it your own, but running it that day can be very stressful. Our services include day of wedding coordination. Your big day will be stress free knowing Black Tie Entertainment is coordinating your wedding day. Our online interactive wedding planning, event timeline and music request lists gives you the power to choose all of your favorite music and plan each event to the smallest detail. That way, on your wedding day, we will already know how to make it perfect for you. 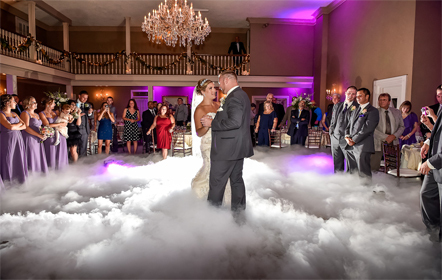 Nothing says “I’m on top of the world” like dancing on the clouds Dry-Ice effect for your first dance. Let us transform your first dance into a truly unique memorable experience that you will talk about with your friends and remember forever. We use a professional dry ice effect machine to lower dry ice into very hot water just as your first dance starts. The effect lasts for about 4 minutes. There is no moisture left on the floor and no fog left in the air. This does not set off any smoke or fire detectors. 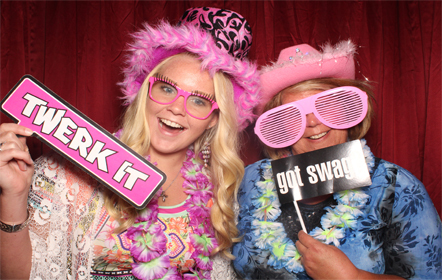 Fun with a Photo Booth! Watch the smiles come out while you create & capture the fun. The best! They are so professional and their equipment and set-up is amazing.They are a true entertainment company and they really made our evening. It took so much stress off of us - we could not be happier with them or more thankful that they managed our wedding with professionalism. Thank you Mike and Casey! We are forever grateful! Thank you times a million for the night of our lives. We got nothing but compliments about you and your set up. You made the night one we will never forget. Overall this was the best DJ we have seen at a wedding and luckily it was ours! Thank you, thank you, thank you!!!! From the inital phone call to the wedding day black tie entertainment made the whole process seamless and easy with all of the planning forms. Casey was amazing and kept the whole night on track!! If there's one touch that wows people, it's a monogram projection. Wedding guests are always amazed when they walk into a room and see the bride and grooms name or initials shining in light. Coupled with up-lighting, the effect can be quite dramatic. We use a state of the art projectors that looks great in daylight and especially amazing during your first dance and evening party. We custom design a monogram based on our tasts and submit several proofs for your approvial. A professionally experienced DJ is the secret to any successful party. You’ve dreamed of this moment since the time you were a little girl, pretending to walk down the aisle in your mom’s heels. You’ve imagined each precious detail from the smell of your bouquet and the design of your gown to that first dance with the man of your dreams, the two of you gliding effortlessly across the dance floor, embracing one another while the sound of your favorite song echoes in your ears and you look radiant. Now that dream is coming true, you have the perfect guy and you have chosen a date. That’s where Black Tie Entertainment enters the picture, we know how special and important this day is to you and we are dedicated to making your dream come true by orchestrating each aspect of your special day to make it hassle free and perfect, just as you’ve always imagined it. Through meticulous attention to every detail of your wedding day we allow you to simply relax and enjoy the moment to its fullest. Contact us today to schedule an appointment in the quiet, pressure free comfort of our office where we can discuss the details of your wedding and how Black Tie Entertainment can assist in making your wedding day extraordinary. 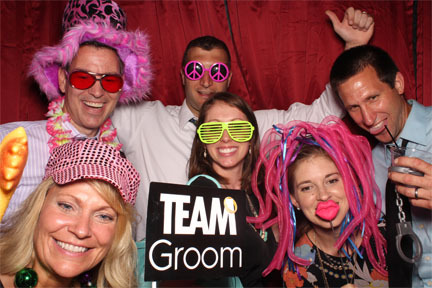 The Traditional option is our best equipment operated by our most experienced wedding professionals. Hear how incredible music can sound in any size venue with our Digital Audio System. Four top of the line speaker arrays fill your wedding with crystal clear highs as two 18" subwoofers take charge in keeping the beat. A brilliant light show keeps the dance floor packed with a magnificent array of high intensity intelligent scanners, lasers, and standard dance lights. If you're looking to create a sensational reception that everyone will rave about for years, then reserve the Traditional Option. 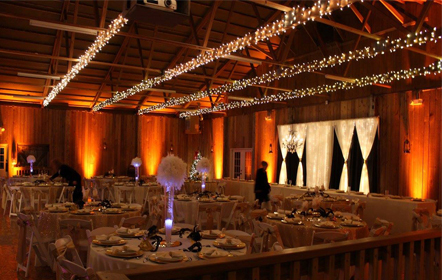 Includes: DJ/MC, Online Event Planning, Digital Audio System, and Dance Floor Lighting. 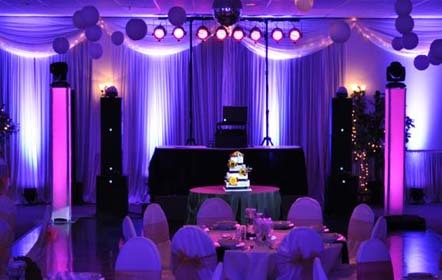 The Celebration option is the ideal equipment combination for an amazing wedding experience as it includes everything in the Traditional option above along with the addition of up to 30 LED Up-Lights placed around the room shinning up on the walls to make your walls any color you choose. 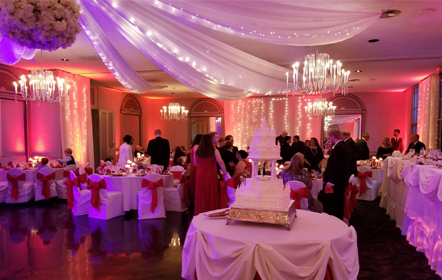 Your wedding will be the celebration of a lifetime with this perfect blend of music, dance floor excitement and Up-Lights that will bring your reception to life! Our Encore option includes everything in the Traditional option along with the addition of 5 hours of unlimited photos in our 10 person Photo Booth, a table full of fun props, a memory scrap book, double photo strips (one for the guest and one for your memory scrap book), digital copies of all images taken at your wedding, personalized logo for each photo strip, a touch screen, external monitor and a secure online event gallery. 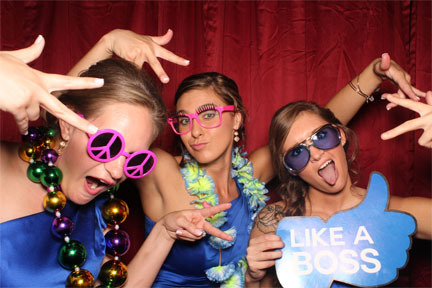 These fun props always end up on the dance floor for even more fun. Our Ultimate option includes everything in the Celebration option along with the addition of 5 hours of unlimited photos in our 10 person Photo Booth, a table full of fun props, a memory scrap book, double photo strips (one for the guest and one for your memory scrap book), digital copies of all images taken at your wedding, personalized logo for each photo strip, a touch screen, external monitor and a secure online event gallery. These fun props always end up on the dance floor for even more fun. Our Prestige option includes our best equipment operated by our most experienced wedding Professional. Up to 30 LED Up-Lights placed around the room shinning up on the walls. A second system and music for your ceremony at the same location if needed. Your "Name in Lights" Custom designed personalized gobo projected from a state of the art projector. Dancig on the Clouds dry ice effect for your first dance. Includes unlimited hours of DJ music. 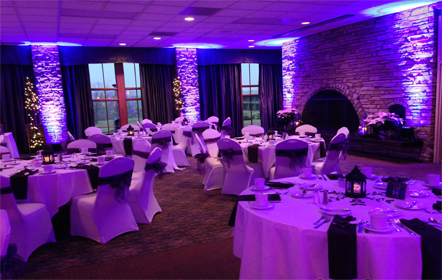 Our Elite option includes our best equipment operated by our most experienced wedding Professional. Up to 30 LED Up-Lights placed around the room shinning up on the walls. 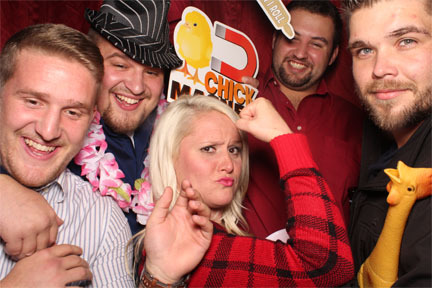 Unlimited photos in our 10 person Photo Booth, props and a memory scrap book. A second system and music for your ceremony at the same location if needed. 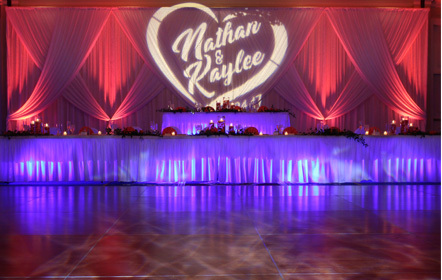 Your "Name in Lights" Custom designed personalized gobo projected from a state of the art projector. Includes unlimited hours of DJ music. The Everything package includes everything we have to offer! Let's get your party started! If your looking for a Wedding DJ Akron or Wedding DJ Canton you found the best Wedding DJ Cleveland and Wedding DJ Medina also Wedding DJ Youngstown. 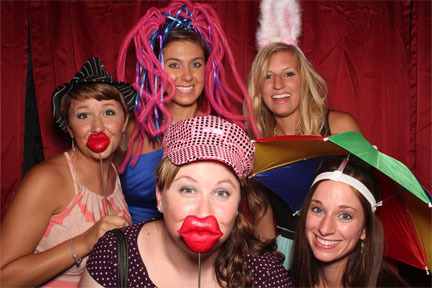 Wedding Entertainment and Photo Booth.